Can anyone lend me two eighty-pound rats? I’d like to rid my house of cats. What you get: This PDF only document is 12 pages long; front and back cover, title page and OGL take up 4 pages leaving 8 pages of content. 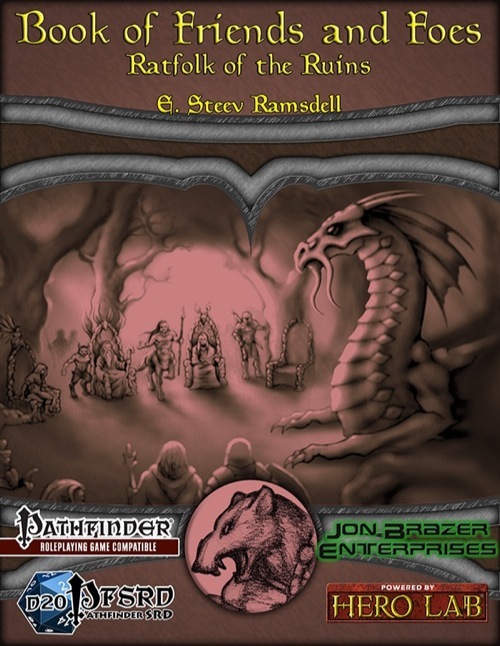 On those 8 pages you get a new race: “Ratfolk” created using the rules from the Advanced Race Guide and 7 Ratfolk NPC’s of the following CR’s: 1/2, 2, 4, 6, 7, and 8. You also get the Hero Lab files for the content. Artwork: There are 5 illustrations in the book ranging from “Meh” to “Excellent.” One illustration is in color (and would not look out of place in a Paizo AP or Module), and the rest are black and white. Layout and Editing: Layout is a standard two column layout. Editing was very good, I noticed only one error in the entire document. Overall Impression: If you came here looking for Wererats, you are in the wrong place. This book is filled with small humanoid rats. Two of the NPC’s listed are low level warriors for another of the NPC’s. The range of listed NPC’s is good. All of them could be helpful or harmful to a party to a greater or lesser extent. Each of the five NPC’s outlined has a reasonable backstory with potential plot hooks that could be used to drop them into an adventure. Final Rating: 4 out of 5 stars. Editing was great, price may be viewed as high for 7 NPC’s. The Excellent artwork balanced out the “Meh” artwork. If you are looking to run a sewer themed adventure, this would be a good investment. Developed by E. Steev Ramsdell. Our first review is a nice 4-Star review. The reviewer called it a nice mix of NPCs. Incase you missed it over the weekend, Ratfolk of the Ruins received its first review over the weekend and it is a 4-Star. Read the review and download Ratfolk of the Ruins today. Rats! Someone beat me to the first review spot. Reviewed here and on RPGnow.com! Thank you for the review Itchy. I appreciate it. Looking for some awesome ratfolk NPCs? Get them now for $1. Just got home from PaizoCon? The I'm Not Going to PaizoCon Sale is still going on, but ends soon. 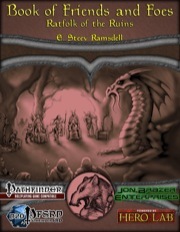 Grab Book of Friends and Foes: Ratfolk of the Ruins for $1 before it is too late.